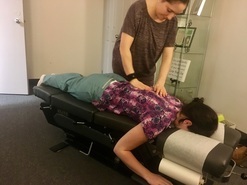 Through the use of our specific, gentle adjusting techniques, we’re able to effectively correct spinal alignment patterns, helping to create comfort and stability as it relates to spinal mechanics and function. Activator Method: Through the use of a handheld instrument, this technique delivers a light, low-force adjustment to the spine. We use this method primarily for those patients who are more delicate or sensitive, as well as it is the primary tool for children and infants. Diversified: This is a classic chiropractic technique that uses hands-on, manual adjusting. Thompson Drop Table: Our specialized tables feature a pelvic piece that has the capacity to drop during an adjustment. This light style of adjusting helps Dr. Doni adjust a patient's pelvis. Webster Technique: This type of adjustment is specific for pregnant woman to help to balance their pelvis.